Is it important to track your expenses? Most people know the importance of tracking their expenses to see where their hard earned money is going but usually feel too lazy to put in the effort to track it. It’s a lot like exercise. You know you should do it but just find yourself not doing it. But here’s one thing you probably didn’t know: It is the very first step to understanding your financial habits and ultimately experiencing financial freedom. Admittedly, tracking your finances is anything but fun or exciting especially during your first days but the truth is, it’s never as complicated as you think it is. Tracking how much money you spend will not only stop you from living from pay cheque to pay cheque but it will also keep you from having the feeling that you have very little to show for your monthly or weekly hard work. It’s quite straight forward. The key to getting the best out of what you make weekly or monthly is to know exactly what you spend your money on – every item bought and every transaction made. Ignorance about where your money goes leads to ignorance of the habits you need to change to make your money work for you. A small leak in a ship is more than enough to sink it in the long run so you need to take into account even the minutest details of your daily transactions as these can potentially send your budget spiralling out of control. The operational phrase here is “Financial awareness” and financial awareness is the stepping stone to financial freedom. Real wealth is made when you make more and spend less. So if you want to be wealthy, you have to quit wasting money and you can only do this if you know what exactly you are spending your money on. One way to ease the tracking of your expenses is to document every penny that you spend in a notebook. If possible, you can make a page for every budget category so that you can know which category takes most of your money. This will give you an idea of your expenses at a glance. This may not be an ideal way to track your expenses but it at least shows you where your money is going. A more effective way to keep track of your expenses is by introducing technology into the mix. There are mobile apps that are designed to illustrate your spending habits with graphs and charts. These apps let you enter your transactions into different categories and can also be connected to your bank account to enable you to track your purchases in real time. 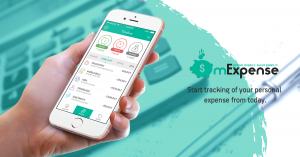 There are tonnes of expense tracker applications online but if you’re looking for a practical, simple-to-use and innovative personal expense tracker, then mExpense is what you need. Android and iOS users can get mExpense from https://goo.gl/SBDae7 and https://goo.gl/TeMJLA respectively. ← Your favourite finance app is now coming to Google Play store!